Protesting further losses in staff and resources to their school, around 200 students from Constitution High School staged a “sit-in” in front of their school’s entrance early Wednesday morning. The school’s staff was informed Monday during an emergency meeting that $90,000 would be trimmed from the school’s budget, according to Kathleen Melville, an English and Spanish teacher at Constitution, a citywide admission school in Center City. The reduction is a result of leveling, the District’s process of reassigning teachers about six weeks into the school year, based on actual enrollments at that time. Students at Constitution, however, feel their school already lacks an adequate number of teachers and staff. “We can’t just sit by and let the School District take advantage of us,” said Christopher Warnauth, a senior. One teacher on the list of possible cuts is the art teacher, said Melville. After deep budget cuts district-wide, Constitution High now has four fewer teachers than it did last year, while enrollment has remained level at about 400 students. The school’s guidance counselor was also cut, as was the case at all District schools with less than 600 students. More than 100 schools, including Constitution, share the services of 16 “itinerant” counselors, who travel among six or seven schools each and have caseloads of around 3,000 students. Students from Constitution preparing their college applications said that they had only seen the counselor once, the first day of school. “We have to find help for college outside of school,” said senior Brianna Harvey. According to Melville, nearly half of the teachers have classes over the limit of 33 students that is mandated by the recently expired teachers’ contract. Melville said that none of her own classes are over the limit. “We would never subject adults to this type of environment,” she said. Protesters were encouraged by the school’s principal, Thomas Davidson, to move inside the building. Before the official start of school, Davidson had warned students of the possibility of facing disciplinary charges from the police. “I am doing everything possible for you not to get arrested,” Davidson told the student protesters. City police arrived about 30 minutes into the protest but allowed students to continue protesting outside the school building. Students were advised by police to move their protest into the school lobby. School police officers eventually began to take down names of those who refused to enter the building once some students had begun to move the protest to the lobby to avoid arrest. 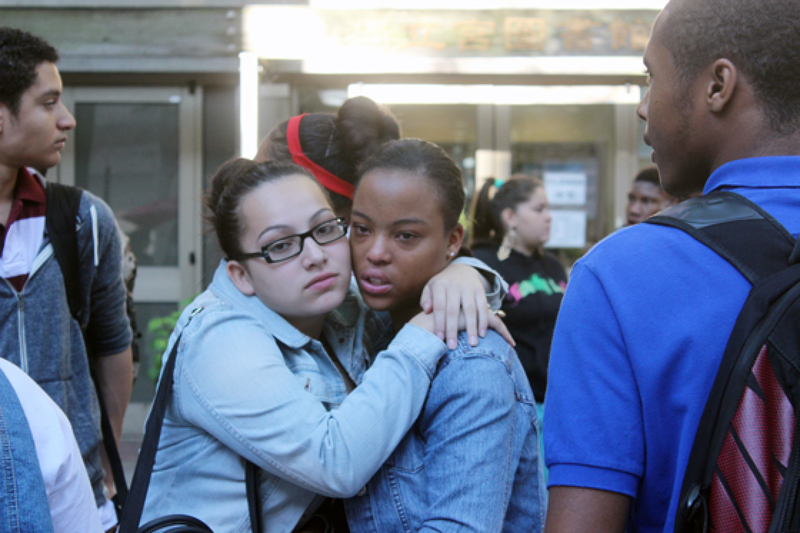 Some students grew emotional as their peers gradually moved their protest to the lobby. Students shouted, “Don’t go in, save our teachers,” but some protesters, fearing suspension, ended their protest outside. *This article originally appeared in The Philadelphia Public School Notebook’s daily blog. Contributed reporting that appeared in the original article has been removed from this version. 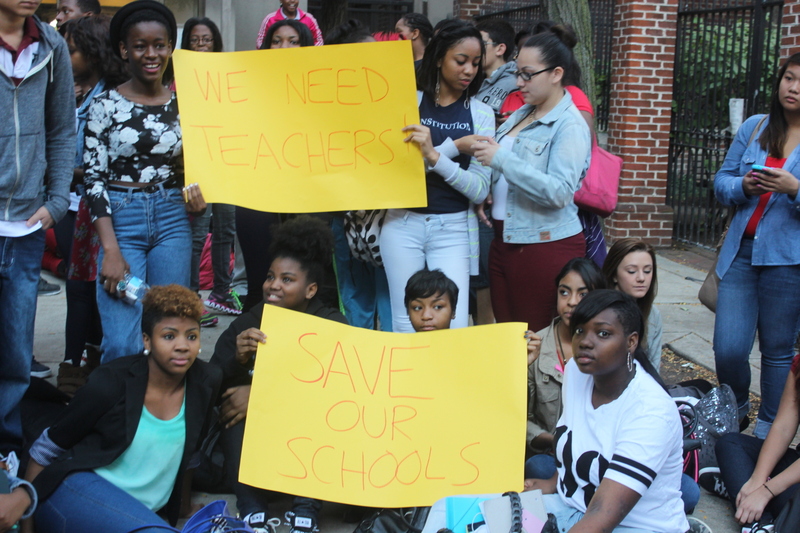 Posted in Breaking News, Education, Philadelphia, Photography and tagged Budget Cuts, Constitution High School, Education, Philadelphia, Protest on May 1, 2014 by Isaac Riddle.